What is the Nut Factor and How Does it Affect Torque? When you tighten a bolt in a bolted joint, you use a twisting force, called torque. Torque is related to bolt tightness, but many additional factors – such as friction – combined into a single “nut factor” can have a significant impact on the relationship of torque to the tightness of the bolted joint. Here’s how it works: As a bolt is tightened, tension develops between the bolt head and the top of the nut. This tension actually causes the bolt to stretch a very small amount, like pulling on a spring. And like a stretched spring which tries to return to its relaxed state, the stretched bolt attempts to relieve the tension by returning to its original length. The result is a compression, or clamp force, which pulls the bolt head and the nut towards each other, clamping the joint together. To ensure the joint is secure, a certain amount of clamp force must be developed – too much may cause warping of the joint or a broken bolt, and too little may risk a loose, unsecured joint. But how does a field operator tightening the bolt determine when enough tension has been reached that will create the right amount of clamp force? Directly measuring tension in a bolted joint traditionally has been difficult. The industry practice has been to measure the amount of torque required to tighten the bolt, and then attempt to relate that torque to tension. where T is the torque measurement, K is the nut factor, F is the tension and D is the bolt diameter. With this equation, if you know K, F and D, you can multiply them to get the torque needed to tighten the bolt so that it has the right amount of tension. The nut factor, K, sums up the combined effects of many variables affecting the difficulty of tightening the bolt, such as friction. Some of these factors include the type and material of the bolt, washer and nut; the presence and type of any plating, coating or lubrication; the pitch or angle of the bolt threads; and corrosion and wear. Because so many variables contribute to the nut factor, the nut factor value may change each time a bolt is tightened—even when conditions seem identical. So, determining the nut factor accurately, in order to calculate the correct amount of torque to apply to a bolted joint, becomes a challenge. Often, field operations personnel will use the chart included with a torque wrench to determine the amount of torque they should apply to a bolted joint in order to get the right amount of tension. However, these torque charts typically are based on the assumption that K=0.2 and experiments show that this assumption often may not be accurate. One way to determine directly whether a bolt will be properly tightened at a specified torque value is with a load cell, such as a Skidmore-Wilhelm. Here’s an example. 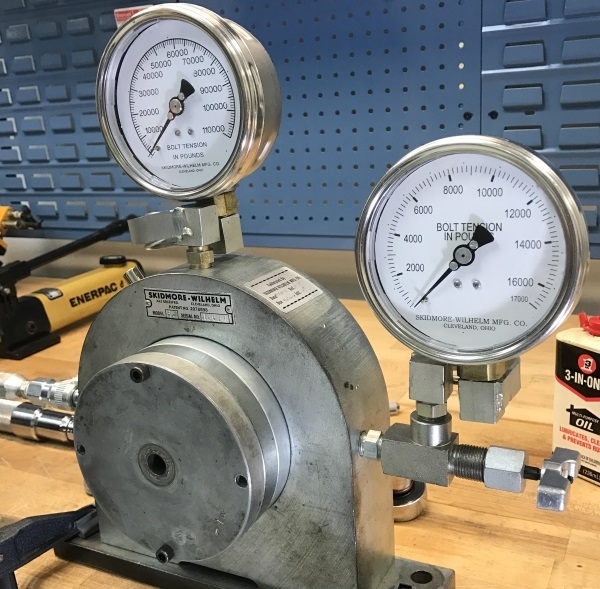 If you set up a nut and bolt in a Skidmore-Wilhelm load cell and tighten the bolt to a certain cut-off spec using a torque wrench, the actual measured tension will not necessarily match the tension stated on the torque chart. If you repeat this process several times, using the exact same bolt, nut, wrench and cut-off spec, the tension may measure a different amount each time. The fact that the tension readings fluctuate and are hard to predict indicates that the nut factor has changed from one time to the next. Because the true nut factor can vary quite widely, relying on the torque spec to determine tightness can sometimes affect the tightness of a bolted joint. 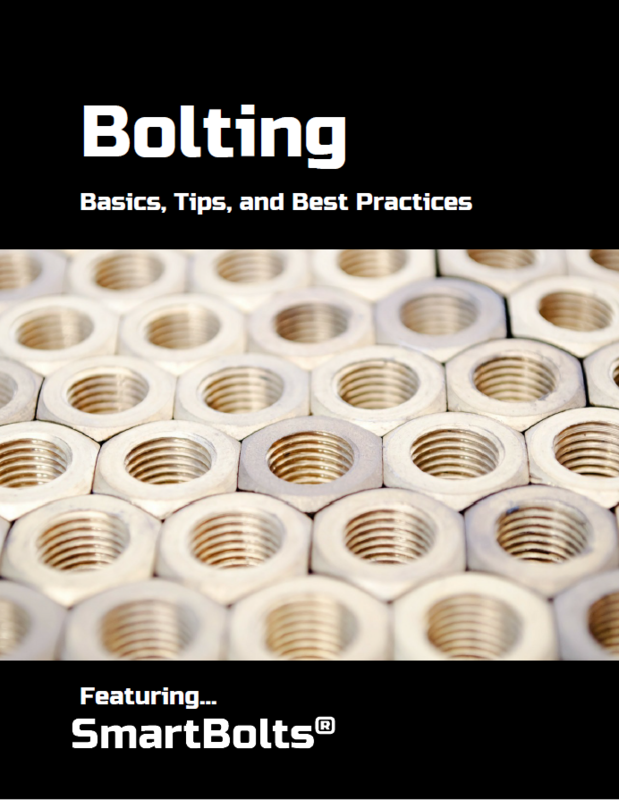 This can lead to bolt failures, possibly resulting in expensive downtime or even accidents. Fortunately, now there is a simple way to help ensure bolted joint security. Instead of using torque tools and questionable torque specs, users can measure actual bolt tension at the time of installation and then continuously monitor bolts for any loss of tension while in service. Direct tension indicating bolts are a reliable way to measure bolt tension, without ever having to consider torque. No more torque wrenches, torque charts, nut factor or short form equation – even any concerns about over- or under-tightening. To bypass the nut factor and torque measurements completely, you can measure the bolt tension directly with SmartBolts®. The patented Visual Indication System™ measures the amount of stretch created in a tightened bolt, in order to ensure a consistent clamp force on critical bolted joints. For more information about how the nut factor relates to torque in a bolted joint, see our previous blog post: The Nut Factor Problem. The SmartBolts indicator turns from red to black when proper tension has been reached and is completely reversible for the life of the fastener. This entry was posted in Insights and tagged bolt security, bolt tension, nut factor, SmartBolts, torque chart, torque wrench. Bookmark the permalink.